The bags are flavour colour coded and there is a background image of potato fields. The info is laid out nicely, with the nutrition contents at the bottom and the selling points at the top - how wonderfully good for you the oil is (sic), that sort of thing. There is also a square in the centre with the flavour written inside it. Unfortunately it's all a bit bland and unimaginative. These Crisps did not really feature a crunch as such. There was an initial crispy bite, but the Crisps all turned very mushy very quickly. While these Crisps were mostly flat and without the texture excitement of oil boils, undulations and bubbly surfaces, they did have a random smattering of orange coloured seasoning as well as some welcome edge skins. The bag explains that Roast Chicken flavour contains: Whey Powder, Yeast Extract, Dextrose, Salt, Sugar, Onion Powder, Sage, Thyme, Citric Acid, Garlic Powder, Black Pepper, Paprika Extract for colour and "Flavouring", which s not just misleading, but a little alarming. Unless told otherwise we will presume that "Flavouring" is Extract of Cardboard. For no other reason than the taste was a little cardboardy. Not necessarily in a completely negative way, it is merely that Roast Chicken has a hard enough flavour to pin down when it arrives on a dinner plate, so the hunt for background subtleties was fruitless. 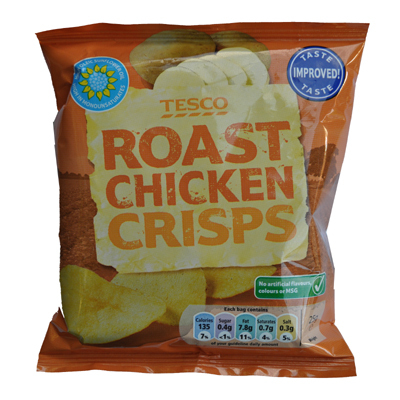 These Crisps actually tasted of a rather well rounded Chicken Crisp flavour. Almost like a Chicken stock cube. Of course, this is nothing like the taste of Chicken, but it is very much like the taste of Chicken flavour Crisps.